LEDs do not consume much electricity even when they are switched on for hours on end. These LEDs are available as a single yellow light and single white light. LED strips are available as multicolored (yellow, green, blue, navy blue, pink and purple). Another LED is sold in the form of ropes. Modern interior designers use LEDs for staircase lighting of various structures including homes, rental apartments, hotels, pubs, factories, and others. Interior decorators use LEDs to create state-of-the-art aesthetic sense to their creations. Moreover, a lighted staircase is essential for the safety of those ascending and descending all year around. Accidentally missing a step and falling or tumbling can be dangerously fatal. 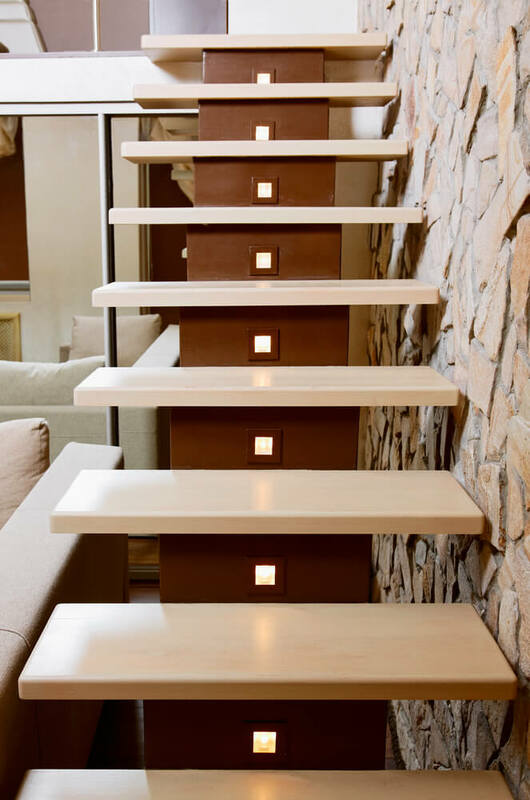 Here we have discussed around 15 different staircase lighting options that can be used for homes, rental apartments and hotels. Use yellow colored dim single circular LEDs for recessed side wall lighting arrangement. Begin by inserting one of the LEDs next to the flattened base of the staircase. Thereafter, insert each of the same LEDs into the side wall adjacent to every step of the staircase. When illuminated, the light from the LEDs shines on all steps starting from the base to the top. Thus, the recessed sidewall lighting enables all to safely ascend and descend. LED yellow strips should be inserted at the base of every stair of the staircase. The light from the yellow strip LEDs, soothing to the eyes, clearly shows the edges of every step. Each stair gets highlighted showing the beginning and end of the same. The light demarcates the beginning and end of every step to take. Whenever the LED strips are illuminated, every stair provides sufficient lighting that enables climbers to go up or to go down. Best is to use square shaped white LEDs available with silver colored metallic frames. Insert two of these LEDs on the visible side of the topmost stair of the staircase. While inserting the two LEDs, maintain the fixed interval space between the two LEDs. Maintain the same pattern while inserting two LEDs on the alternate stair of the staircase. Thus, do not touch the stair right below the topmost stair of the staircase. Again, work on the third stair from the topmost stair of the staircase. Insert two LEDs on its visible side similar to the topmost stair of the staircase. When illuminated, the two square LEDs provide sufficient light for visibility for safely using the staircase. Add square-shaped, wooden framed, yellow dimmed LEDs for decoration at the center of every step riser. These LEDs produce recessed lights on every step riser and make the visibility clear for users. Light from the illuminated LEDs is soothing to the eyes. The warm light shines directly on the stairs in front of them. All climbers easily ascend and descend the staircase. You can use some readily available LED strip lights for staircase lighting. You can insert these LEDs to every underside of every stair or step of the staircase. When illuminated, these strip LED lights shines from the underneath surface of every step. The light from the bottom of every step safely guides all users to climb up and down. You can light up a Floating Staircase using white light strip LEDs. When illuminated, the white light of the LEDs guides all climbers to ascend and to descend. Thereby, the lighted steps of the floating staircase offer safety to all. People using carpet floored staircase along with fasteners should use recessed LED lights on alternate risers. There are two folds purposes: First of all, LED lights to guide climbers to safely ascend and descend the staircase. Secondly, the carpet should be flat and climbers must not trip over it. Begin from the topmost stair. Insert a single round yellow dim LED on the wall adjacent to the staircase. Thereafter, skip doing anything to the very next stair below it. Following, insert another LED on the wall adjacent to the third step. Again, skip one stair and insert another LED on the wall of the fifth step. Continue the pattern to the base of the staircase. If after illumination sufficient light shines at the base, then another LED need not be inserted. The staircase is often used as part of the interior decoration of homes, mansions, hotels, etc. In most cases, there are exclusive chandeliers along with star-shaped lights from the ceiling. Often, the hall-way is perpetually well illuminated so people can see well while using the staircase. Additionally, the wall adjacent to the staircase has lighted lamps with decorated shades. On the single side wall adjacent to the staircase, insert LED rope lighting. When illuminated, the LED Rope lighting provides sufficient white light to see every step. All climbers can ascend and descend the staircase with the utmost safety and comfort. There are many hues available in accent light LEDs. In order to produce a modern look with purple, LEDs illuminating purple color has been used. These purple LEDs are fitted to the base of every stair of the staircase. When illuminated, the purple colored light falls on every step guiding climbers. You can use white LED strip along with green colored glass stairway. Otherwise, you can also use green colored LED strip along with white or green colored glass stairway. When illuminated, the staircase has greenish light guiding people to ascend or to descend. You can insert white LED strips under each stair of the staircase. When illuminated, the light shines from the above stairs onto the stairs in the bottom level. The under step LED lighting guides all those who use the staircase. You can use different colored LED strips to create multicolored accents lighting for a modern staircase. Most pubs, disco, and other modern popular entertaining centers sport this sort of staircase. This staircase, for example, uses colored LED strips to create a pattern of illuminated steps. Start from the bottom stair, insert light blue colored LED strips on each of the three stairs. Thereafter, use dark blue colored LED strips for the next three stairs. Following, use Pink colored LED strips for the next three stairs. Insert Green colored LED strips for the following three stairs. Add another Pink colored LED strips for three stairs. Eventually, insert yellow colored LED strips for three stairs. The railing, attached to the adjacent wall of the staircase, provides extra support to all ascending and descending. Underneath this railing, there is enough space to insert LED rope light. When the LED rope is illuminated, the light shines directly on the staircase. Thus, everyone gets to see the very next step. The specially made spiral staircase is a decoration on its own. These staircases are illuminated using chandeliers and hanging staircase lightings. Generally, the chandeliers are made to hang from the ceiling. As for the hanging staircase, lightings are sported as wall hangings on the adjacent wall. Both chandelier and wall hangings when lighted provide adequate light. People can safely ascend and descend the staircase at all times.